20 minutes from boiling the pasta water to table. Do you ever have those days when everything you do seems to put you further behind time than ahead? No matter what you do you’re running late. I had one of those days recently. I try to get dinner on the table around 6pm. That night I didn’t think it would happen, or even close. You have to have your ducks in a row to do this in 20 minutes, but I have proven it can be done (without too much stress)! It just takes a little planning. 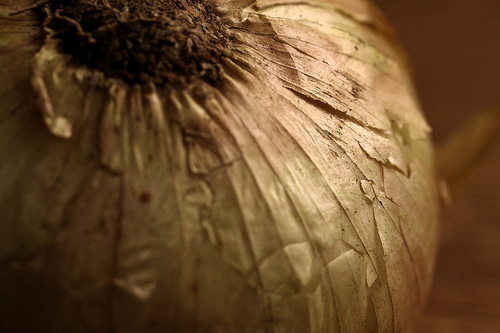 Even cooking a nutritious dinner in 30 minutes is considered quick. 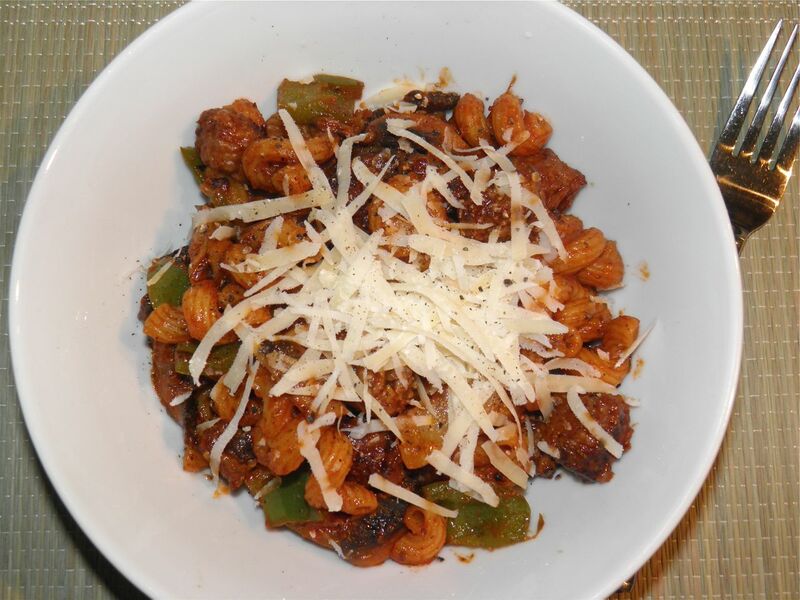 This recipe combines delicious “meatballs” of sausage, with barely crisp vegetables all tossed in a light coating of pasta sauce. The short time actually benefits the vegetables. 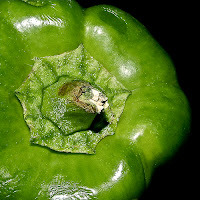 We tend to overcook green pepper in particular in pasta dishes and they end up too soft and unappealing. For the pasta it is best to use something that has tooth to make the sauce cling. 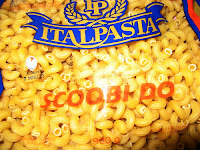 I used scoobi do (think corkscrew penne), but cavatappi, fusilli, or even regular penne would work. Just make sure it has good ridges on it. The length of cooking time for your pasta will impact the speed of this recipe. 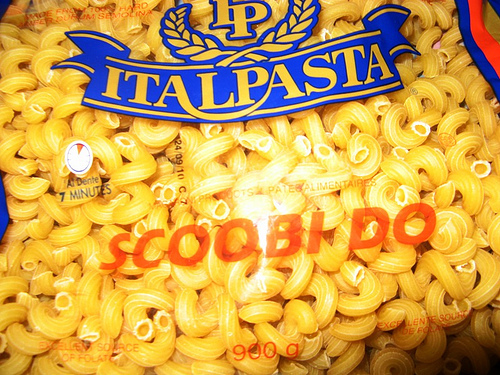 Scoobi do takes 7 minutes. Un-cased (loose) sausage is sold in the meat section in 1 lb flat packages in the meat section of grocery stores. Cutting the loose sausage into cubes aided in the speed of this recipe immeasurably. They even retained their shape when cooking. Usually meatballs take forever to shape. If you can't find it you can remove the meat from sausages and pull chunks off the links. That's a messier and time consuming procedure though. As an aside note, today I found a site with a wealth of homemade sausage recipes. Italian, bratwurst, chorizo... Once I get to try some, there will be more on that! Bring salted water to a boil in a lot large enough to hold the pasta. Heat a large sauté pan on another burner. While the water is coming to a boil remove the sausage (in one piece) from the package. It will be in a flat rectangle. Take a sharp knife and cut the sausage into little squares. This will take 2 minutes, tops. These are your "meatballs." Toss the meatballs into the sauté pan and fry until browned and cooked through, about 5-7 minutes. Remove from the pan to a bowl. Leave any collected fat in the pan. By now your water should be boiling, so add in the pasta and set a timer to al dente cooking time for that pasta. Mine was 7 minutes. While the meat is frying cut the vegetables in large but still manageable chunks. 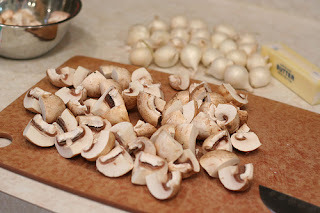 After the meat has browned and has been removed add the onions and mushrooms to the sauté pan. Let cook for about 3-4 minutes, then add in the green pepper. Fry all the vegetables together for another 3 minutes, then add the sausage back in, and the pasta sauce, oregano and pepper. When the pasta is done, drain and add to the sausage sauce. Toss well to coat and heat through. Serve immediately with grated cheese and some crusty rolls with butter. * You will note there is no salt in the ingredient list. Check the label of your pasta sauce for salt content. The sausage and parmesan add salt content as well, so don't add salt just because you think you should. There is probably enough in your ingredients. Have just stumbled across you when doing an Internet recipe search. I copied and printed a few of your bread recipes and look forward to making and tasting them Thank-you, Elizabeth R.